Birds are the Gardeners best Friend. I have not sprayed my garden for bugs in 35 years. 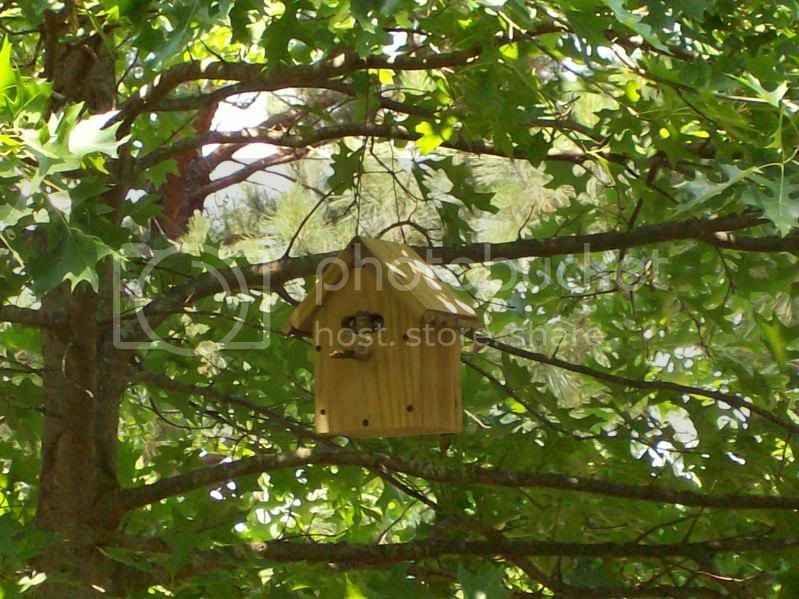 I put 25 bird houses around the garden area and back yard the birds eat all the bugs. I put several bird bath type containers of water in the garden so birds can drink water and not peck holes in my tomatoes to get a drink. Wrens eat their body weight in bugs every day. You can attract a lot of Wrens if the houses are build the correct way and mounted the correct way and height. 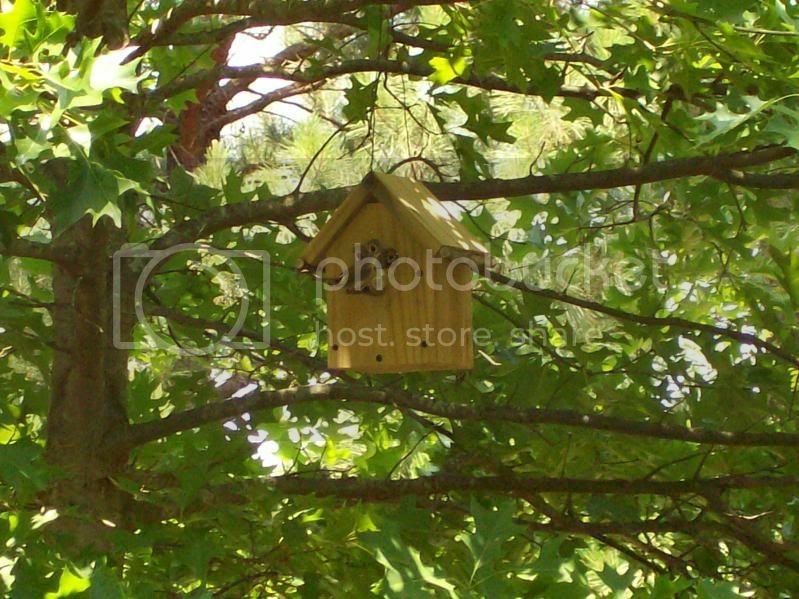 Birds like the house hanging from a wire over a tree limb rather than screwed ridged to the side of a tree or pole. Houses need to be 8 to 10 feet off the ground with the door facing east. Bottom of the house is made from 1x4 lumber cut in square that measure 3.5" x 3.5" square. Cut the corners off 3/4" so the floor has 4 air vents in the corner of the room. The door should be 7/8" x 3" wide 4" up from the floor measured on the inside. The left and right side wall should be cut 1/4" too short this makes another air vent under the eves of the roof. The point of the roof needs to be cut off 3/4" to make 2 more air vents. The roof needs to hang over the front and back 3/4" for a rain guard. The perch is a 1/2" diameter tree limb glued into a 1/2" hole 1" below the door. The 3" wide entrance hole makes it easier for the birds to build a nest. It also allows 3 tiny hungry babies to look out to see when Mom is arriving with their next dinner. Re: Birds are the Gardeners best Friend. Nice gary...do your wrens stay all year? I only have them seasonal, but the sparrows have a welcome stay here. It has took them a while but have recognized Japanese beetles as a food source. Gotta love 'em. I have a few bird houses and a feeder that is always full year round. Not too mention 2 humongous willows that can house hundreds of birds no problem. Oh and the neighbors pond is a their water source. Been watching the robins steal my worms all day long since my yard is near flood stage and the worms are coming forth. I am going to have to some fat robins this year. It depends on the birds. I have doves and sparrows that will eat slugs but it is usually after I catch them slice them in half an set them aside. Birds will go after geckos. The cattle egrets do come by after I weed whack the grass and hunt for bugs. However, bulbuls, mejiros and rice birds prefer to eat orchid flowers, ripe papaya, rice, chili peppers, and tomatoes (especially the red ones). The birds have also discovered sunflowers thanks to bird seed sold with sunflower seed in them. imafan26 wrote: It depends on the birds. They've destroyed pumpkins, squash, tomatoes, arugula, broccoli, and cauliflower, and this year they're trying to get at my corn. The only veggies they leave alone are the onions, garlic, and leeks. Robins' nest in the honeysuckle on the wll trellis against the house -- eggs have hatched and I can hear the first tentative cheeps. Chickadees in a birdhouse on the fence -- so far managing to stave off the house wren trying to wrest the house away, though I did find a speckled eggshell on the ground several feet away (but may not be theirs). A pair of cowbirds were hoping to get in and do their dastardy baby switching act, but I put a metal opening limiter on that house so only chickadees and wrens can get in. Chickadees come back to roost in the evening twilight and scold me if I'm still hanging around that part of the garden. Titmouses in an old chickadee birdhouse on the plum tree. This house is lashed to the tree and I can't clean it out -- somewhat low like 4 feet above ground. It's been home to wrens, chickadees, ants, .... The opening has been chewed up by squirrels. This year, a pir of titmouses decided to move in. They "modified" the opening some more. Close to my compost piles. This pair also checked out the newer box on the swing set fort. I think it didn't like the metal opening limiter -- probably a wee bit too tight for them. I looked in there but it was empty. Maybe house wren will move in when they're here. Pole mounted bluebird house by the family room window. Carolina Wren was looking at it. It was used by Carolina wrens last year. Old beat up decorative bird house near the apple tree. There is no way to clean this house but it has little twigs sticking out, so it was climbed by wren at least. Wren house on the golden locust by the mailbox -- it was one of a pair of houses we first put up years ago. The tree has swallowed the plastic coated wire that was used to "hang" the box and it can't be taken down. Never been cleaned, but house wrens nest in it every year. Last year, there were also house finch nests and robins nests in other trees and shrubs. Yes, there are birds and then there are birds. The ones applestar was talking about are very beneficial in the garden. Most birds, even seed eaters, do eat insects at certain times (e.g. for feeding their young). Many of us do not have to deal with birds like peafowl, bulbuls and rice birds! I have a couple bird houses and several bird feeders (black oil sunflowers, thistle seed, dry mealworms, some suet in winter) in a couple different locations. We always have birds nesting in the huge old lilac, often it is robins. I forgot to mention that I heard chirping in the wall. Some birds, I don't know which kind had broken through the attic eave vents and were nesting in the attic. I had to to change all the screen vents to metal vents. We have many birds of many species in our yard. I'm sure that they are very helpful in the fight against the pests, but we still have to stay constantly vigilant against the pests. The snail out produce any of our efforts. There are the flea beetles that surface about twice per growing season. There are the constant aphid outbreaks, thank goodness that they are picky as to what they eat! We have been beetles, squash bugs, leaf footed bugs that attack the tomatoes. It is fun to see those areas where a tomato worm has hit a tomato plant, but the worm is nowhere to be found. Bet a bird got that one! Lastly there are those voracious Japanese beetles, who really like to each our egg plant leaves, but they like many other plants as well. That said, most of the pests are manageable and are kept under control via hand picking, as long as we stay ahead of them in the early stages of infestation. The aphids are not nearly as bad, if we can keep the ants out of the garden area. Try growing some grapevine, even wild grape, in your garden. The Japanese beetles prefer it over anything else, especially when it is flowering. So it makes a great trap crop for them. At one point I was capturing JB's off the wild grape vine (grows as a weed around here) and killing them. I finally decided why bother killing them (which I kind of hated to do, they are part of Nature too, and are really beautiful, like living jewels), as long as they were only hanging out on the weed grape vine. Worked just fine. I grow a wild, naturalized flower garden area. We have noticed that the Japanese Beetles love the zinnias and are always on them, mostly to the exclusion of other plants. Interesting thing is that there is never any obvious damage on the zinnias. My guess is that they are feeding on the nectar or pollen. We also have lots of native grape vines growing in the woods at the edge of the yard. Perhaps they have been drawing the pest away as we'll. We encourage the birds in our area too. 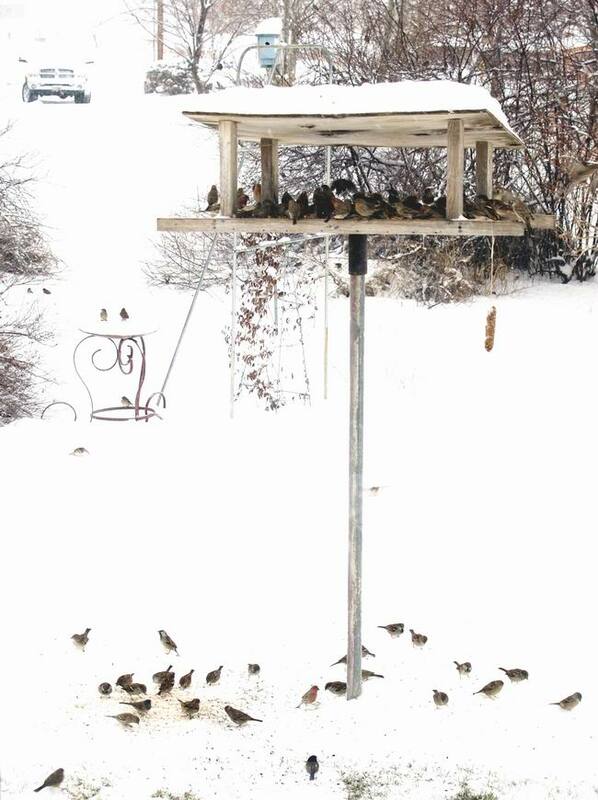 This is a winter pic, but we feed the birds year round and always have water available. overall I think it is worth what they take for the beauty and joy their presence and songs bring. Yes, I do suppose they eat lots of insects too. The birds are welcome here. Alas, can't seem to get any wrens. I have houses up. They used to come when we lived by the river, but they don't seem to like the present territory. Does anyone have issues with birds eating their fruit? I have talked about putting up some bird nests but they would be located near grapes, raspberries, blueberries, cherries and strawberries. Also some apples, peaches and pears. I would hate to attract them to a house located near this fruit just to have them eat it all and then me want to evict them. TheWaterbug wrote: Absolutely. The feral peafowl rampant in my neighborhood are the bane of my gardening existence. She laid it on a dirt path, where we walk every day, right outside our window. They're as stupid as they are destructive. I love watching birds. I have a bird feeder on my back porch and I can watch them from my kitchen sink window. The only problem is I have noticed that they are picking and choosing what they want to eat. They are making a mess all over my back porch. I usually have Mockingbirds, robins, mourning doves, bluejays and cardinals that stop by. Does anyone have suggestions of what I can put in the bird feeder that these birds will especially like? Right now it is just a bag I am buying at Wal-Mart. Moles are organic Gardeners best friend.